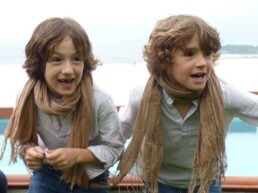 Alejandro and Gonzalo are 8 years old twins. Both love football, but they are very different : Alejandro very fidgety and happy, Gonzalo a very sweet and sensitive. Silvia their mother contributes to menudamoda, a blog created by her sister Carmen.